Educators today are commonly working in multilingual classrooms and face the challenge of engaging a linguistically diverse population through concept-based inquiry while simultaneously supporting language development for the language of instruction. These students enter the classroom with funds of knowledge on which new learning can be built. This article brings together effective practices for language development and concept-based inquiry to simplify some important principles all educators should consider. As an international educator, most of my action research questions have focused on the needs of language learners. I have been driven out of a desire to meet their needs and help my students achieve their full potential. Questions about how language works, how to teach literacy skills efficiently and effectively, the role of home language, what tools and systems will help, and finally how to both foster and capture conceptual understandings drove me to read, research and attend professional development courses. Through research I have discovered a few fundamental learning principles that are relevant to all international educators no matter the context or language of instruction. These learning principles can positively impact the learning for all students. Conceptual understandings can both deepen and become visible to the learning community. Their self-efficacy and sense of agency will grow as they reflect on learning that was relevant, engaging and comprehensible. Give sufficient time for exploration through experiential learning. Use it for pre-assessment, to identify misconceptions, to draw out questions and to cultivate curiosity while making language development relevant. The mathematics process of developing conceptual understandings applies to all learning (Van de Walle, Lovin, Karp and Bay-Williams, 2014). Piaget and Vygotsky have shown that learning is constructed through tangible, concrete, social experiences (Woolfolk, 2014). The more concrete, hands-on experiences our students can have throughout the unit of inquiry, especially in the first couple of weeks, the more powerful and meaningful the inquiry will be for them (Fahey, 2012). Using concrete learning experiences fosters language development by making the content comprehensible (Hamza, 2016). It makes learning tangible, which in turn fosters the curiosity needed for questioning. Through experiential exploration, students can make connections to their funds of knowledge, and identify relevant local issues alongside deepening questions for the investigation stage (Custance, Dare and Polias, 2012). How did people build homes in the past? How did people survive in the past? How do people find a spot to start a town? Through the weekly use of learning stories, I was able to monitor developing understandings as students reflected each week. Reflections showed developing understandings. The learning environment as the third teacher is where learning takes place and should be a stimulating, anxiety free space where mistakes are seen as opportunities and where the voice of the child is heard as a social environment. Foster a learning environment that meets the students where they are and cultivates a culture of curiosity, growth mindset and social construction of ideas within their zone of proximal development (Dweck 2016; Woolfolk, 2014). The environment should honor learning and provide resources to make learning accessible. According to Loris Malaguzzi, the learning environment is the third teacher as it represents our values and beliefs about children, delivering the unspoken messages about children’s rights (Edwards, Gandini, & Forman, 1998). John Dewey wrote about the power of an environment and its role in social function for bringing about change and social improvement over perpetuating the old behaviors that benefit a few (2015). Value home identity and culture through the strategy of translanguaging to foster understandings by using home language to make meaning at critical times (Garcia & Kleyn, 2016). Make home language welcome in the classroom from the first day of school by honoring the student’s identity through language profiles. Translanguaging used thoughtfully, at critical learning moments enables students to converse in their home language to make meaning (Garcia, & Kleyn, 2016). Use the think-pair-share strategy for a translanguaging moment. Visual scaffolding connects pictures with text for meaning making (Harrel, & Jordan, 2015). The environment in my classroom became a visible language rich resource and my students could easily refer to the displays to support making connections and language needs. During “how we express ourselves”, we deconstructed traditional stories to identify the elements while creating a visual display for accessibility of information. A class concept map of materials and matter that we constructed and extended each week through discussion on “how the world works”. 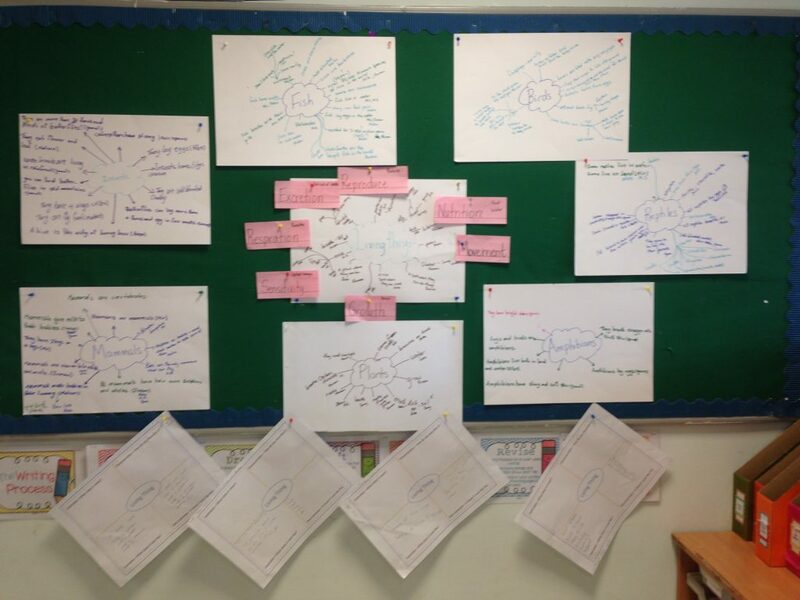 For “sharing the planet”, we used concept maps throughout the entire unit of inquiry. Team Frayer Models were used to develop definitions of a living thing. To foster a social learning environment, recognize that all learners benefit from time to learn together as a whole group through modeled thinking and instruction, in small groups and in pairs (Custance et al, 2012). Students need opportunities to deconstruct things such as a genre or process and to construct as a whole group and in small groups before you can expect them to try it alone (Custance et al, 2012). That is why transdisciplinary learning is so beneficial for the inquiry-based classroom. Language reading and writing skills can be taught and developed throughout the inquiry process within a relevant context as they learn to read and write about what they are learning through the transdisciplinary theme. Integrating the targeted genre via a summative assessment task, gives the genre context for meaningful engagement with the language strands (IB, 2018). Below are some examples of genre integration. Living things depend on their natural environments for survival. 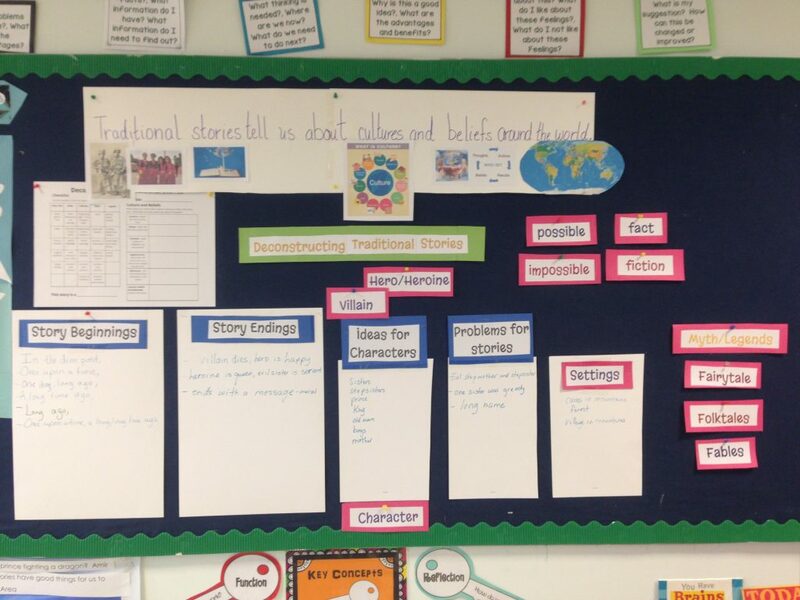 Traditional stories tell about cultures and beliefs from around the world. Materials behave and interact in certain ways, which determine how people use them. People create organizations to solve problems and support human endeavor and enterprise. Explicitly teach, model and construct generalizations together throughout the inquiry process. Give more time for thinking and synthesizing. 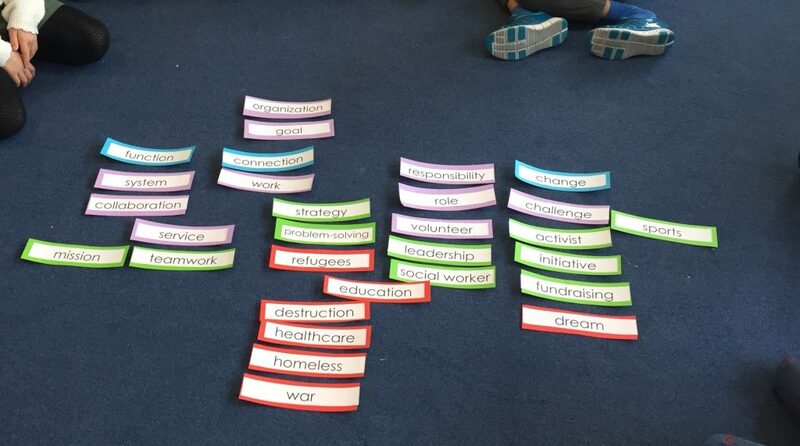 During “how we organize ourselves”, we organized the concepts we learned about organizations in the first weeks of inquiry together on the carpet. 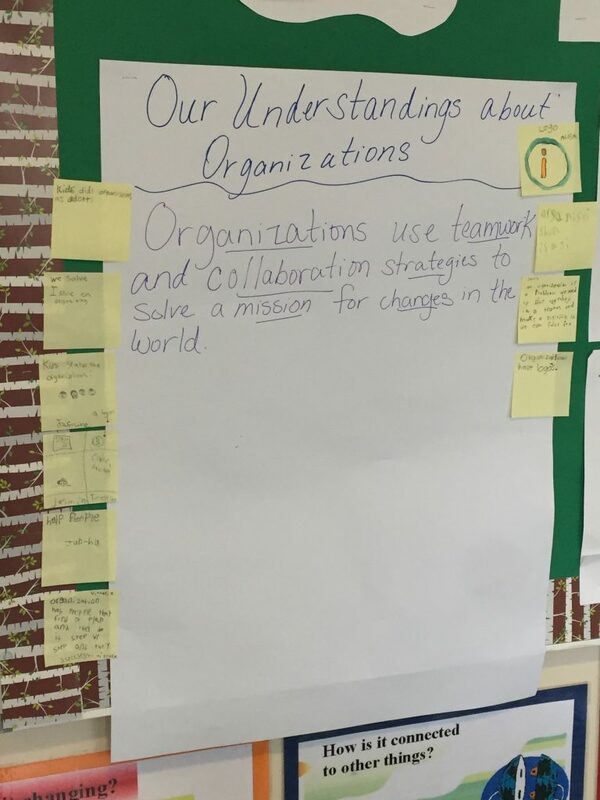 We worked together as a class to generate a statement of understanding about organizations. 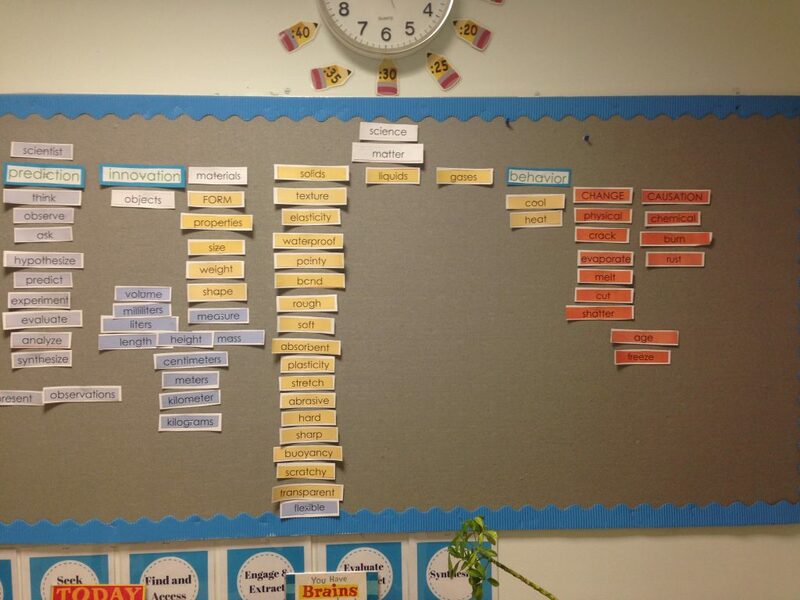 Our understanding was including on the classroom display to refer to as the unit of inquiry continued. Hattie and Yates suggest that concepts serve as mental “coat hangers” allow our students to organize their learning to make sense of it (2014). Just as we take the time to explicitly model and teach literacy or mathematics processes and skills, it is essential to teach and model the skill to make generalizations. Generate-Sort-Connect-Extend is an example of a visible thinking strategy that encourages students to make connections between concepts by drawing a line to connect concepts and identifying a new generalization (Ritchart et al, 2011). It extends the concept map to facilitate transfer. 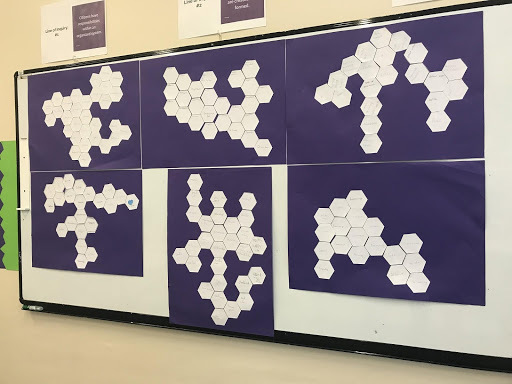 Hexagonal thinking is another way for students to organize their learning visually and then create generalizations to state why the concepts are connected to each other. The IB Prmary Years Programme (PYP) approaches to learning now include the skill of “information transfer”, which recognizes our role in facilitating transfer (IB, 2018). There are many tools that you can use to help students make connections to the concepts while also making their thinking visible to the learning community. Begin to explore this area of instruction. Our language learners can participate in concept-based inquiry while learning a second or third language if the supports are in place. 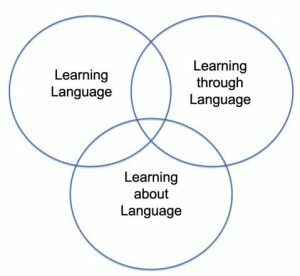 Language learners develop understandings and language simultaneously when provided the support, tools and a language rich environment. Hexagonal thinking where students write a concept or idea they learned on each hexagon and then begin to sort them. Make generalizations afterwards. Sorting macro and micro concepts to generalize. Generate all the concepts learned, sort the macro concepts (those that affect many) to the top and the remaining micro concepts stay on the bottom. Make generalizations. 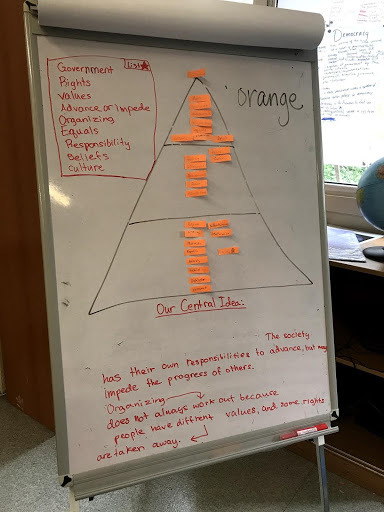 Visual scaffolding of the unit vocabulary, the class questions organized on the iceberg and a graph on sugar from our choices unit on “who we are”. Barnes, M K, Johnson, E C and Neff, L. 2010. Learning through process drama in the first grade. Social Studies and the Young Learner 22 (4) 19-24. Dewey, J. 2015. John Dewey: The collected works of John Dewey [Kindle edition]. PergamonMedia. Dweck, C S. 2016. Mindset: The new psychology of success. New York, NY: Random House. Edwards, C, Gandini, L, and Forman, G. 1998. The hundred languages of children: The Reggio Emilia approach – advanced reflections, 2nd ed. Westport, CT: Ablex Publishing. Erickson, H L. 2007. Concept-based curriculum and instruction for the thinking classroom. Thousand Oaks, CA: Corwin Press. Garcia, O and Kleyn, T. 2016. Translanguaging with multilingual students: Learning from classroom moments. New York, NY: Routledge. Halliday, M A K and Webster, J J. 2016. Aspects of language and learning, 1st ed. Sydney, NSW: Springer. Harrel, A L and Jordan, M. 2015. 50 strategies for teaching English language learners, 5th ed. Boston, MA: Pearson. Hattie, J and Yates, G C R. 2014. Visible learning and the science of how we learn. New York, NY: Routledge. Learning and teaching. International Baccalaureate. 2018. Cardiff, Wales: Peterson House. Murdoch, K. 2015. The power of inquiry. Northcote, Vic: Seastar Education. William, D. 2011. Embedded formative assessment. Bloomington, IN: Solution Tree Press. Woolfolk, A. 2014. Educational psychology: Active learning addition, 12th ed. Boston, MA: Pearson. Hamza, T. Stephen Krashen: Language Acquisition and comprehensible input. Retrieved from: https://www.youtube.com/watch?v=fnUc_W3xE1w. 28 January2016. Van de Walle, J, Lovin, L H, Karp, K S, and Bay-Williams, J M. 2014. Teaching student-centered mathematics: Developmentally appropriate instruction for grades pk-2, Vol. 1, 2nd ed. New York, NY: Pearson. 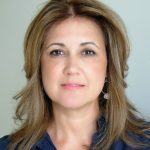 Evelyn Galan has 15 years of experience in working in international education, having lived in five different countries. She currently works as an international educator, serving as the Deputy Principal and PYP coordinator at MEF International School in Istanbul, Turkey. She is a certified Concept-Based Curriculum and Instruction (CBCI) workshop leader. Previously she was a homeroom teacher in an IB PYP multilingual school in Erbil, Iraq teaching grade 2 as well as facilitating English as a Second Language in the mainstream workshops for the faculty. Evelyn began her career in international education in Cancun, Mexico where she served as English coordinator and homeroom teacher in a bilingual school over a period of 11 years. Working with language learners throughout her entire career in education has taught her to seek out best practice strategies in order to meet the learning needs of her students and to support the needs of her colleagues. You can follow her on Twitter @Leona_alegre. The enhanced PYP is here! Time to celebrate: Your digital resource PYP: From principles into practice is now available on the programme resource centre. Learn how to strengthen programme implementation by reviewing this previously recorded series of webinars. We take data protection and data privacy seriously. How do we handle your personal data? Find out here. Access our early years resources here. Use this page to help PYP parents understand the programme. We conduct Outcomes research to investigate the impact of the programme on students, teachers and schools, and Curriculum research to support the development and review of our programme curriculum and pedagogy. See our latest study on the transcultural capability and the PYP here. Did you know we’re very active on Twitter? Follow us @IBPYP and stay up-to-date with the current programme developments. Join our IB PYP Educators group on LinkedIn. The views and opinions expressed on this blog are those of the authors of the articles who are independent of the IB and are based upon their own experiences of the PYP. These views and opinions do not represent or reflect the views and opinions of the IB. This blog may contain web addresses of web sites created and maintained by other public and/or private organizations. These links have been included by the authors of the articles who are independent of the IB. The presence of a link is not an IB endorsement of the site and the IB is not responsible for the content of external Internet sites. When you copy a link to an outside web site, you are subject to the privacy and security policies of the owners/sponsors of the outside web site(s). The IB is not responsible for the information collection practices of non-IB sites. You are reminded that while all web addresses referenced in this blog were correct at the time of publishing, links can quickly become obsolete and we are unable to guarantee that links will continue to remain active. We apologize if you find that a particular link no longer works.